I love Coffee and Donuts! That's why I love hanging out at various tea and coffee shops around the metro. Drinking Coffee in moderation is not bad. Your coffee and tea actually contain a group of antioxidants called flavonoids. 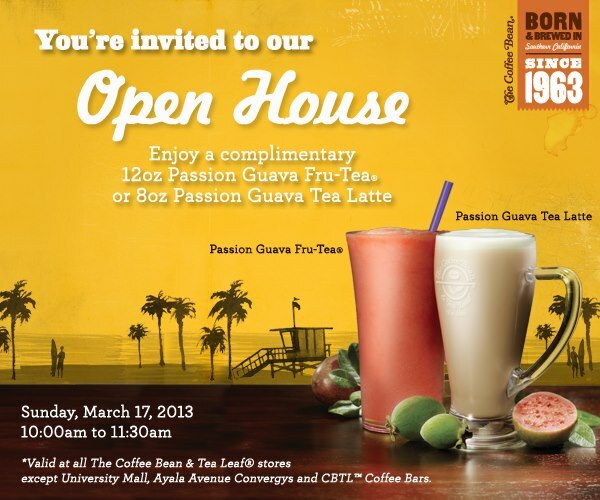 Coffee Bean and Tea Leaf Open House! Yehey! Take note of the date please. On March 17, 2013 from ten a.m. to eleven thirty a.m. you and I will get to enjoy a complimentary 12 oz. Passion Guava Fru-Tea or an 8 oz. Passion Guava Tea Latte absolutely Free! Dear Readers, please read the small prints, may exemption po ha? Please take note of that, baka magwala kayo sa galit ( ha ha ha! Joke.) pag doon kayo napunta sa branch na walang open house at ma disappoint po kayo. God bless you!